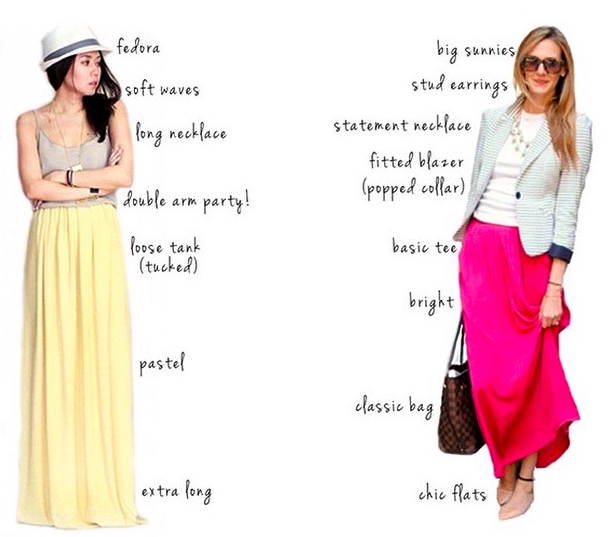 Whether we’re talking about Maxi skirts or Maxi dresses, we must admit that we absolutely adore them all. After all, they’re comfortable, feminine, and effortlessly chic – so why wouldn’t we? That said, the top two reasons why Maxis are one of our favorites fashion staples are that they are flattering on all body types and they’re super versatile! With a huge array of designs and prints available, the floor length Maxi is so flattering that it’s often the go-to maternity pick for moms and moms-to-be alike as it allows them to stay stylish without having to sacrifice an ounce of comfort. Maxis are also the *perfect* choice for those of us who crave for outfits that effortlessly go from day to night. As you can see on the photo above, by replacing just a few accessories, you can transform a Maxi from a casual look to a professional one and vice versa in a snap. If you are unsure and/or curious as to how one can work a Maxi to transition from one season to another with style – don’t fret, we’re here to help! Check out our tips below on how you can do so fabulously! For an effortless summer look, pair a tee with your brightly hued maxi. Tie the tee right your waist and complete the look by adding some summer inspired accessories! Maxi skirts and dresses looks great with a crop top. You can choose to wear it higher on your waist so you show very little skin, or wear it lower to bare your stomach. Go for a bohemian look by pairing your Maxi with a loose, off-the-shoulder tee. A fan of the contrasting feminine and rock and roll combo? Pair a pastel/ feminine hued maxi with combat boots and top it with a leather jacket! For a the perfect spring outfit, pair a floral maxi with a basic tee, and layer with a cardigan. Dress up your Maxi for work and/or a night out by wearing it with a button-down shirt and heels. For a casual chic look, pair a denim shirt tucked into a maxi skirt. Cinch the waist in with a thin belt to accentuate your waist. If you plan to hit the beach or catch a music festival, wear your maxi skirt to a festival or to the beach, and protect the bottom by tying it into a cute knot. If you love wearing hats, adding a fedora to your Maxi outfit instantly makes it “scream” Summer! When it comes to shoes, you can’t go wrong with flats – from gladiator sandals to ballet flats, they all make the perfect pair for a stunning spring/summer Maxi outfit. Though bright colored maxis suit the warmer season, opt to wear Maxi in darker shades such hunter green, grey, purple, brown, and black for fall & winter. 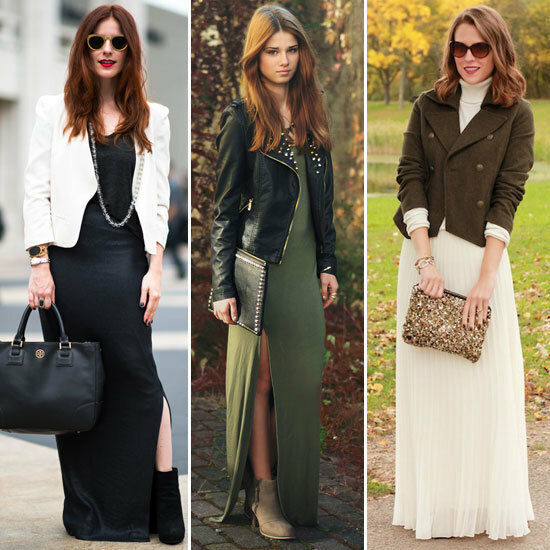 Depending on the temperature, add layers to your Maxi with a chunky sweater, a cropped peacoat or a leather jacket. For an effortless yet sophisticated work appropriate look, top your pleated maxi with a fitted blazer over a solid color tee. Pair a simple maxi skirt with a long sleeved shirt and a scarf makes a great look for both fall and winter (PS: for added warmth and style, add a hat – wool floppy hats are the best picks). Layer necklaces of different lengths (don’t forget the bracelets and rings too!) to add some “pizzaz” to an otherwise plain outfit. To keep your feet warm and toasty, pair your Maxi with an ankle length booties. Looking to get a Maxi? You can’t go wrong with the oh so versatile solid black!